A True American Craft: Handsewn Shoes. | A Continuous Lean. 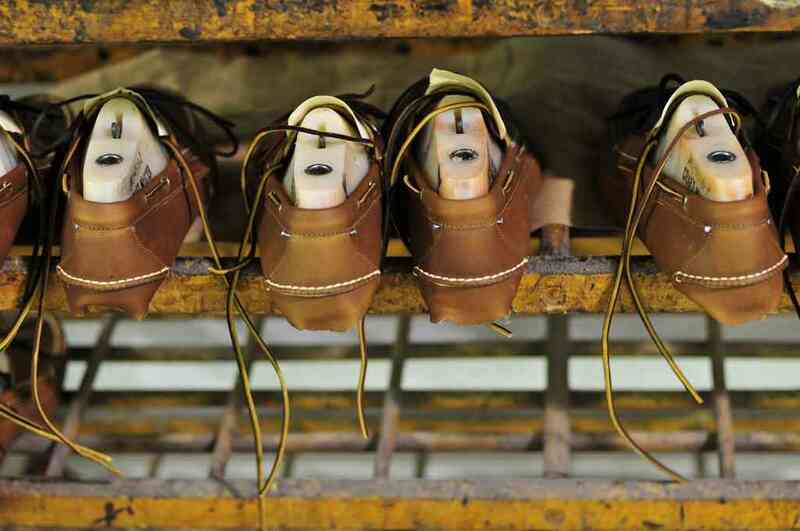 A True American Craft: Handsewn Shoes. It’s hardly a recent revelation that the pieces that define â€œAmerican style,â€ are so rarely produced in this country anymore. If you’re reading this site, it’s safe to assume that you’re aware of the steady deterioration of America’s garment industry, but (thanks in part to our shared awareness) there has also been the reactionary effect of bringing production back to the states. This can be seen in the multitude of shirt factories, denim labels, brands, and sites such as this across all categories that have opened over past decades. These contemporary companies were not formed to compete with the mammoth conglomerates that produce overseas, rather they provide a higher quality product for a conscientious consumer. Again, this is not at all new revelation, but it does place the sheer resilience of America’s hand-sewn footwear brands in context. While many industries exported their production and have only recently begun to see a continental renaissance, our country’s small-scale hand-sewn shoe businesses have endured all along. These footwear brands, some of which have been around for over one hundred years, were able to convert the Native American moccasin tradition and weather the mercurial attitude of the American consumer year after year. The perseverance of the American hand-sewn moccasin industry has a lot to do with pragmatism, as it’s simply not possible to match the quality of a hand-sewn shoe on a mass scale, and yes at times many of these labels have remained stuck in time, immune to the progressions of the clothing industry as a whole. This general stoicism paid off though as the wave caught up to them so to speak and the rising interest in hand made shoes, especially those with a â€œMade in Americaâ€ tagline, also opened up space within this field for newer, more creative labels to exist alongside the stalwarts. Foundational styles like the classic New England three eyelet camp mocc and ubiquitous boat shoe, are now joined by brightly colored loafers, pony hair lace-ups, and even stitched sneakers, making this an undeniably exciting time for handmade footwear in America. From the centenarian sewers with their ancient techniques to the budding brands that are changing what we think of when we hear the word â€œmoccasin,â€ here’s America’s mighty crop of hand-crafted shoemakers. Fact: Founder Harry Smith Shorey was afflicted with Polio and chose to make hand-sewn shoes because it was a task that he could perform while sitting down. 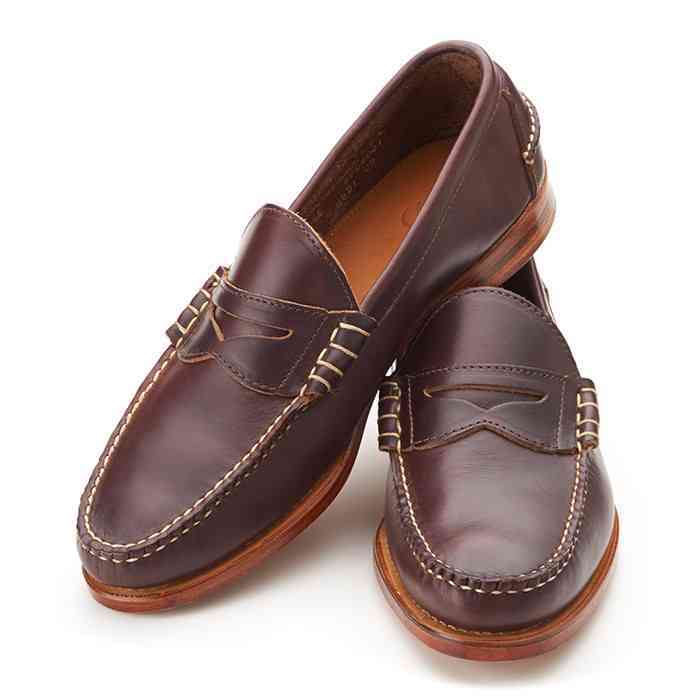 Specialty: Classic perimeter laced non-slip soled boat shoes that are about as iconic as it gets. Found at: Mr Porter, J. Crew, and Leffot, just to name a few. Fact: President Dwight D. Eisenhower, the King of Nepal, and Robert Redford have all proudly worn Russell Moccs. Specialty: Big, burly, brown leather boots designed to trudge through the Midwest’s worst. Found at: Haven, Nepenthes, and Context. Fact: Arrow boasts one of the most endearingly old school websites online. Specialty: Understated, no-frills, round soled moccs, with sharp white stitching all the way around. Found at: Nepenthes, and their own website, that’s about it. Fact: Townview’s are literally home-made, since day one Galen and Gayanne Wintle had made all of Townview’s moccasins in their home studio. Specialty: Double soled moccs, perfect for lounging around the house or a quick jaunt around the block. Found at: Their charming site, and occasionally eBay. Fact: With a penchant for stamped leathers, insane patterns, and hybrid styles, Yuketen was the first company to really push the moccasin into a new, more progressive territory. Specialty: Hand-made leather shoes that have increasingly more innovative and off-the-wall as the years have gone on. Found at: Gentry, Inventory, and Union LA. Fact: The Rancourt family has been producing hand-sewn moccasins in Lewiston, Maine for three generations. Specialty: Smart slip-ons and lace-ups that are both office appropriate and incredibly comfortable. Found at: Brooks Brothers, Band of Outsiders, and Harrison Limited. Fact: Founder George Vlagos’ father John was a master cobbler who ran his own shop and it’s there that George first became interested in the art of handmade shoes. Specialty: As their name would imply, Oak Street’s Trench Boot, a sleek, plain toed stomper, is what they’re best known for. Found at: Independence, Nordstrom, and The Woodlands. 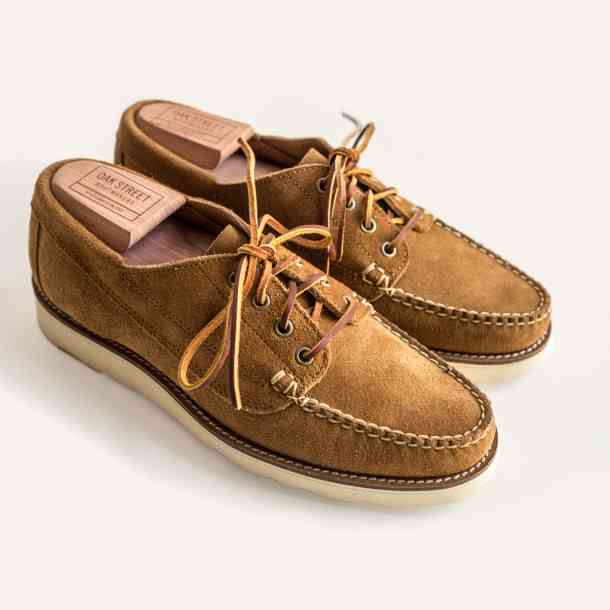 Specialty: The shoes that made Dexter, Maine famous – simple, no-frills, leather soled moccs. No more, no less. Found at: Exclusively on the Wassokeag site. Fact: The New England Outerwear guys actually took the plunge and purchased their own factory in order to start the brand. Specialty: Classic mocc styles that have been given a facelift through bolder color schemes and unique hides. Found at: Blue Button Shop, Kafka, and Off the Hook. Fact: Not much is known about Waltzing Matilda as they’re yet to come out with their first collection of shoes, but they purchased an old factory up in Maine earlier this year and they will be debuting footwear next summer. Found at: No where as of yet. That Arrow company has a really good line of moccasins. I’ve worn my canoe mocs for 3 years now and they feel better every time I put them on! Thank you for the interesting article. My grandson told me about your nice website. Sadly, yet again, none of these companies produce any in a size above 14, with the majority capping out at size 12 or 13. Relegated to topsiders yet again. This is awesome! Being a craftsman myself, I can truly appreciate the work put into something that comes up as something unique and of the finest quality. This article is very helpful. I found OakStreet Bootmakers to be of particular interest. I’m between a 9-10 in most shoes and boots, but I just got a pair of 8.5D Oak Street Pennies off eBay that are actually too big. Don’t underestimate the stretching power of Horween Chromexcel. Are you sure? Russell Moccasin will do custom. Not cheap, but not crazy $ either. I’m a big fan of buying American. Keep jobs at home and support US families. Of the above companies, I’ve tried Rancourt (and it’s Eastland variations) and Quoddy. Rancourt seems to make a more substantial product in terms of leather and sturdiness. Quoddy, while still good and use quality leathers, seems loose and stretchy and more casual.